Another day, another civil war filled with chaos and battling and even more chaos. 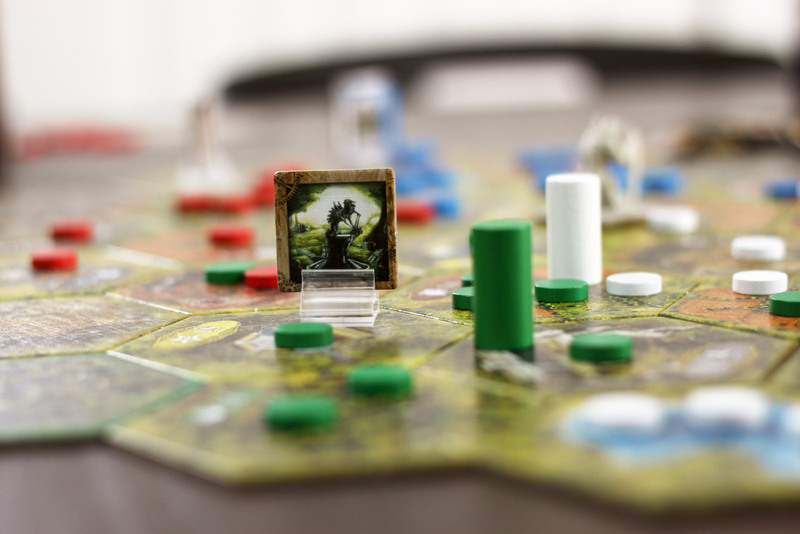 What’s a board gamer to do? Obviously, hunker down, grab a pencil, and start boiling some water. After all, this is a steam-powered world, and it’s your chance to take command of a massive army, stake your claim on the world’s resources, research powerful abilities, and conquer the other, lesser races. In other words, play Clockwork Wars. 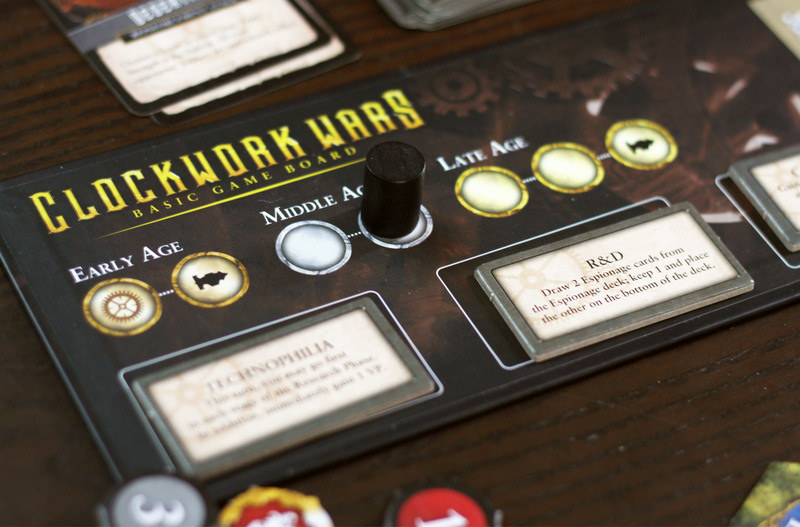 Players in Clockwork Wars are vying against each other to score the most victory points. Points are scored by controlling Lakes and Forests in the scoring rounds, controlling the Court in the scoring round (if there are points involved), and by unlocking certain Discoveries which allow additional point-scoring methods. The game lasts 7 rounds, with each round divided into 5 phases, plus an extra scoring phase on the 2nd, 4th, and 7th rounds. During each phase, all players resolve all of the necessary actions before moving on to the next phase. In some cases, these actions can be performed simultaneously, while others are sequential. The phases are generally straightforward and logical, so I’m only going to go in depth on a couple of them. Combat: Players with units in the same territories fight! Scoring: Only on certain rounds, players score points based on lakes and forests they control, and the Court ability activates for the player who controls it. The Deployment phase is the core of the game, really. Everyone secretly writes orders, and then you reveal and place your units. These units can go on any territories adjacent to those you already control; you may also “force march” your units through an empty territory, providing you place at least one unit there. You can also send your units to the Court, which has two functions; first of all, to play an Espionage card you must remove one of your units from the Court. Secondly, during scoring rounds, the Court has specific actions that can be utilized by the player with the most units. Combat is another major element. During combat, victory is determined by sheer number; the majority wins. 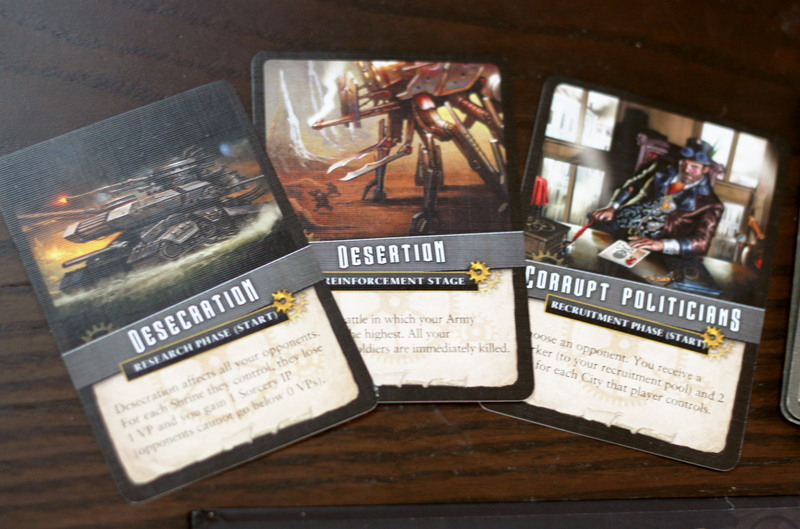 However, there is a “reinforcement” phase, in which players have a chance to move units around. Certain Espionage cards can provide a boost or a tactical move. Citadels, a type of territory, can send units to adjacent territories. Oh, and certain special units or Discoveries can provide reinforcements. After that, you simple add up the numbers. If you don’t have the most, you lose everything. If you have the most, you still lose units, but you keep the difference in power. Example – if Sarah has 5 power and Joe has 3, Sarah wins but must lose all but 2 of her units. This would still be true if a 3rd player were present – if Taylor has 1 unit, Sarah still keeps 2. A note about research: when you pay for a Discovery, you get the ability, but the Discovery itself gets placed on the board. If someone else conquers the territory containing it, they steal that ability from you (and you lose it). In addition, there are only 9 discoveries each game. 1 per discovery type (Science, Religion, and Magic) per age (Early, Middle, Late). Something else worth mentioning – there are two phases that really have the potential to do a number on your units. At the end of the Combat phase, you’ve got to check your supply lines. Any disconnected territory automatically loses one unit. Then, at the end of the Scoring phase, you must deal with Pollution. Each resource territory – that is, forests or lakes – automatically removes all but 1 unit. You tend to get more points by stacking up units in a scoring territory, so… you’ll have to face the consequences of that. At the end of 7 rounds, whoever has the most points wins the game. Steam-Powered Glory, or Blowing Hot Air? 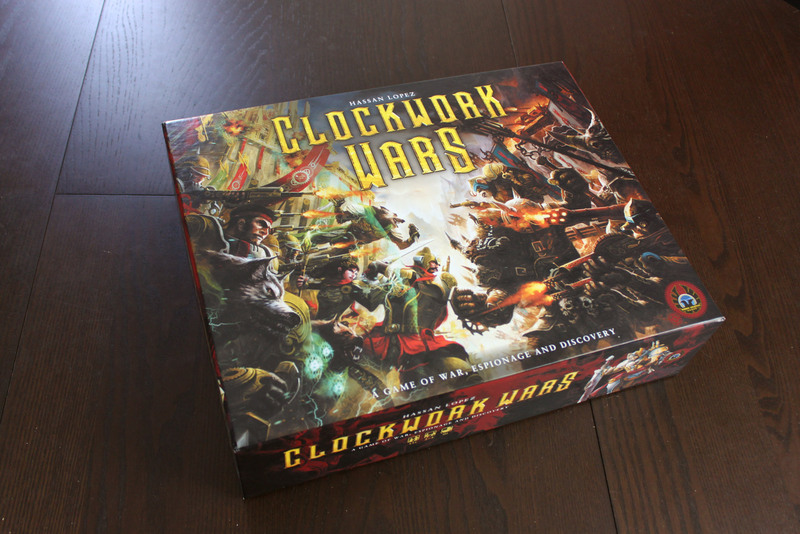 Clockwork Wars has proven a tough game to write about. Namely, because it’s not exactly the game I expected it to be, and when a game surprises you by coming around at a surprising angle, it can be difficult to discern what is a game flaw and what is simply preference. But then, I am a game reviewer, and that means I get to lambast my preferences all over the place, so I’ll say this; Clockwork Wars is not what I expected it to be, and I think it could be a better game than it is. At the same time, there are a great number of very fun elements, and fun is what games are all about. There’s definitely an audience for this game, and maybe if you better know what to expect you’ll have significant appreciation for it. What this game is, is a take-that 4X game. Well, maybe 3x – not a lot of eXploring going on in the mix. But you fight your opponents and build your kingdom and collect resources to spend on new technology. And then you use that technology and play Espionage cards to build a giant mop and a giant steam-bot to wield it and you wipe the floor with your enemies. It’s not unheard of to mash styles together, and this game certainly gives the mix a solid run, but I’m not sure these two styles really belong together. See, generally 4X games reward long-term planning – building up a strategy over time, calculating risks, minimizing luck, and having backup plans for when things go wrong. On the other hand, Take-That generally relies on the energetic fun of doing something Absolutely Ridiculous and No Doubt Overpowered, crushing the plan your opponent came up with two minutes before. You feel a bit down when you get crushed, but you also sort of laugh about it, because it was kind of cool/funny/epic, and anyways your next turn you get to smash everyone right back in the face. In the face, and you play for a while and destroy each other and then you’re done. It’s like a wizard’s battle – lots of mighty, flashy spells going back and forth, each doing something wild in turn. Unfortunately, when you try to mix the two, the strategy side of things tends to fall apart. When you’ve got a strategy and someone takes-that it away, it feels less like something awesome has happened and more like something has been taken away from you. So, it really is fun to play. 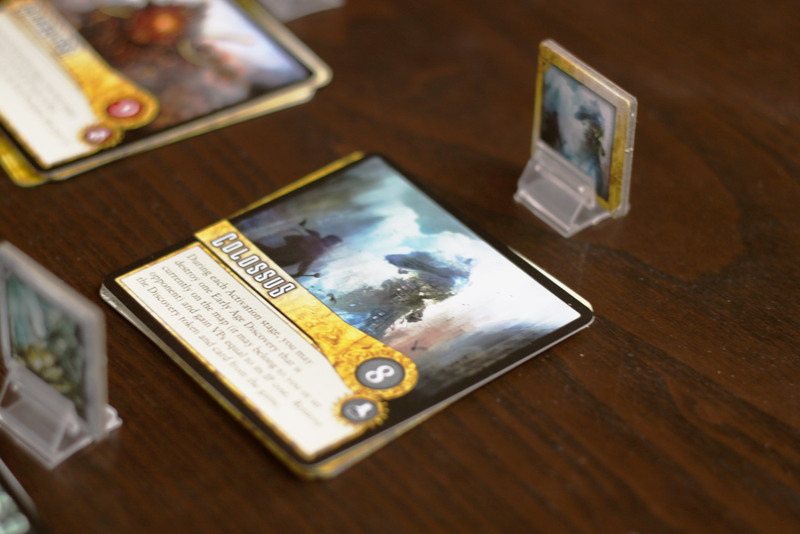 Lots of powerful things to do – destroying enemies from afar, surprising them with an Espionage card that wipes away a huge enemy force, tricking them into bribing you to play a card when it turns out that card hurts them. The Discovery powers are pretty epic, and they grow stronger over the course of the game. At the start you’re just getting better at buying things, or improving your combat by a few steps. By the end, you’re squashing Discoveries for points or sniping enemies from across the globe (also for points). Maybe you’ll just blow up a piece of the map so NO ONE can have it, ever think about that? 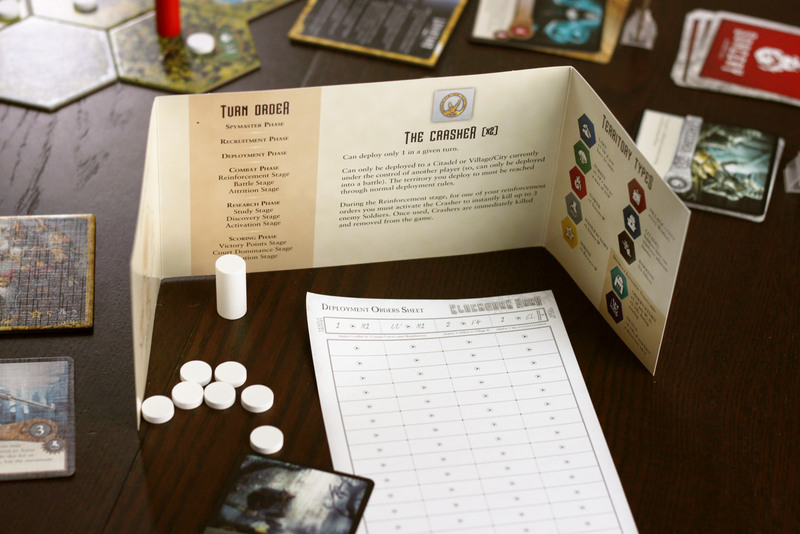 There are a number of Discoveries in the box, but only 9 of them – 3 from each type, one per age – get used per game, so you’ll have plenty of variety and replay value simply to see how the powers actually work out in game. As for Espionage cards – well, there’s a whole deck of them, but you’ll probably go through that deck since they’re fairly key to victory. The powers are large and grand and epic and a lot of fun to use. Oh, and the Generals too. There are 3 generals in the box (and a number of slots in the box insert that implies many more generals to come) that you can buy every game, and those add a whole new level of certainty. At least, to the player who gets them. The Guardian is impervious to attack (but immobile), the Leviathan wins any one battle without casualties (and scores points for enemies killed, huzzah! ), and the steam tank is a mix – mobile and reusable, and adds a lot of power to any battle it fights, but not unlimited power and it might get destroyed. These things are fun to use, oh yes, they are quite entertaining, but they tend to come out in massive spurts that cause a great change of the winds as far as who is actually winning. Even some of the strategy-level stuff is quite well done. The whole “deployment” phase is straightforward and also excellent. It saves a lot of time, compared to other war games, since all players are deploying at once, and you’re trying to figure out where the other players are going to deploy their stuff. Whether you want to be aggressive or simply defend your holdings, you’re going to have to guess where your opponents are going to confront you, and that provides a solid bit of exciting tension. You’ve also got a clever set of mechanisms to keep things streamlined. Citadels provide defense simply by sending reinforcements to adjacent spaces during the battle phase, and Cities are simply villages with three or more units on them. Supply lines keep things interesting – you can’t just stretch out as far as possible without someone trying to cut you off and deplete your units without even a fight, and even Pollution prevents someone from building up an impenetrable stronghold of units on the point-scoring locales that just keeps getting stronger as the game goes on. 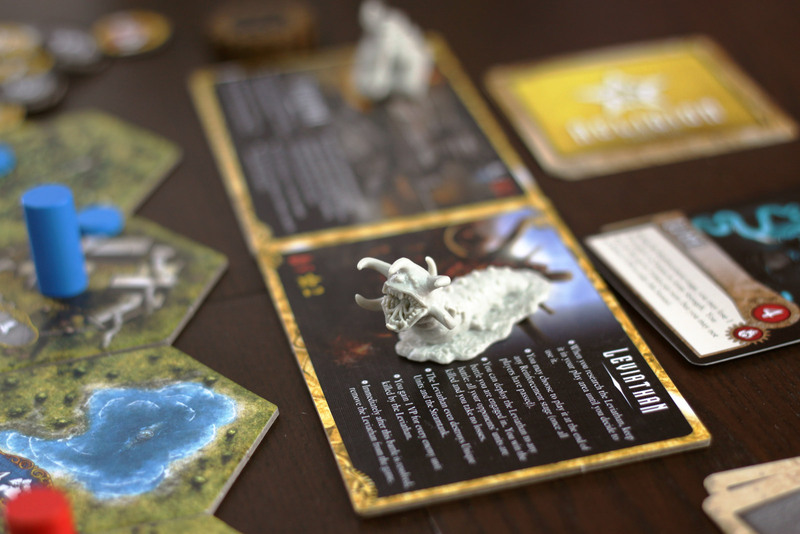 All of these strategic elements suggest that the core of the game should be about playing the long-term game, with smart planning, well-thought-out strategy, and strong tactics. You feel like that’s the case, too, when you start playing. But then, you commit a large force to make sure you keep a hold of that very important territory, only to be squashed by a single, out-of-nowhere Espionage card. It’s not like you could have planned for that. There’s no defense. No way to fight back. In a way, it’s almost worse than rolling dice and losing out thanks to bad luck. There are so many random elements that, while by themselves aren’t very significant, just sort of pile up and make all those strategic choices you made during the game feel worthless. For example, the reinforcements phase is nice – but there are barely any places to reinforce from, so it’s basically just whether or not someone has a “Screw you” card to play. The only real source of reinforcements are Citadels, which are randomly placed on the board and may or may not be anywhere useful (or anywhere near you at all). The same is true of villages – you need them to get bigger armies and do more useful things, but if there aren’t too many villages near you, it sure is hard to build cities in order to recruit more units to travel across the map and obtain some villages to turn into cities. This feature is pretty cool. Do you want to play the “realistic” map or just use the abstract icons? 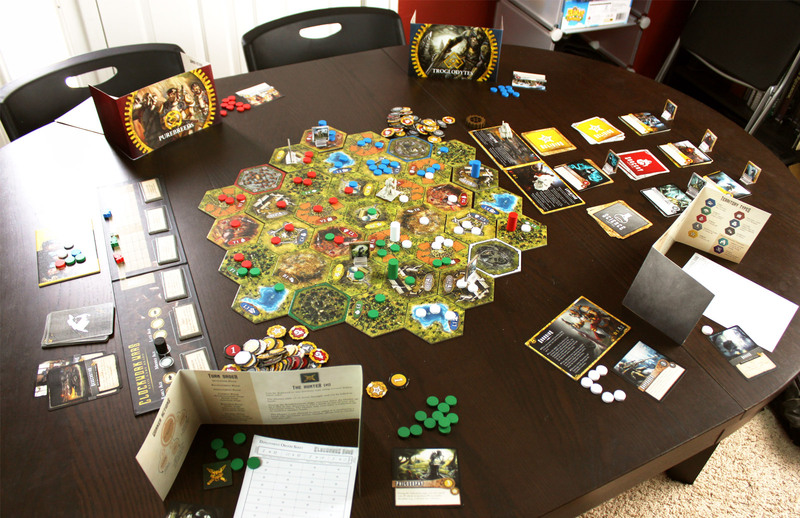 There’s also a stagnant feeling to the board, since you can’t really move units once you place them. Only with certain Discoveries or Espionage cards can you get things anywhere, and those are rare. You end up fighting major battles in key territories, only to have a stack of units you just have to ignore on the next turn since the important battles have moved elsewhere. That’s probably overstating it, but hopefully you get my point – you can’t move your troops around, and that feels limiting. Look, I get “take-that” games. I enjoy them, when they’re good. All it takes is a limited game time (which this game has), the ability to bounce back (which this game, generally, has), and the chance to smack your opponents right back (which this game has, usually, although you might overlook it). The problem is, half of this game makes you feel like you should have a little more control, a little more strategy, and a little less… chaos. As it is, large armies can suddenly appear in a huge array of possibilities, so even troop placement feels somewhat random. Including Forced March options, you can reach half the map on the second round. Discoveries: once you get them, they might be stolen. Defend them well. For all my ideas, it’s true that I am not a game designer. Perhaps these ideas wouldn’t work; perhaps they were tried, and the designer shaved things off to keep it streamlined. I’d personally prefer to have slightly more complexity and slightly less Hulk Smash powers. Now, I don’t want to leave the impression that this is a bad game. It really isn’t, it’s not a bad game. It’s a decent game, maybe even a good game for all it does well. It just falls short of being a great game. And oh, by the way, these components are beautiful. The minis are detailed (although my Steam Tank came a little bent out of shape), the art is fantastic and extremely evocative. The tiles are thick, the wooden tokens are nice and numerous. 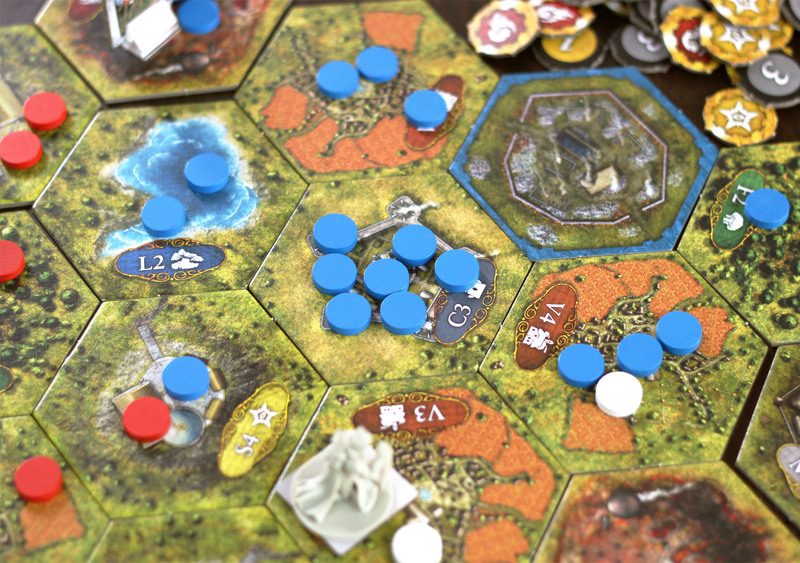 Oh, and in a clever design move, the territory tiles are reversible – if you prefer to skip the realistic “Grassy” art, you can use the abstract side featuring the color and icon the tile represents, which makes the board configuration clearly visible a half-marathon’s distance away. 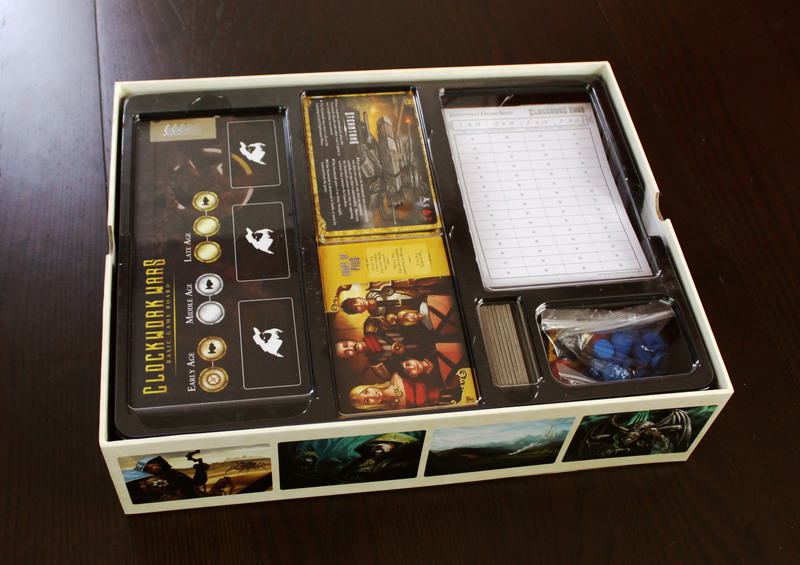 The box insert is also incredible, with plenty of space for the components and expansions, slots for everything, and a clear plastic cover to keep everything in place even when the box goes sideways. It’s brilliant. I wish I could say I loved Clockwork Wars. There is a lot of great stuff here, but it’s tempered by an odd mix of styles that doesn’t work particularly well. The hint of 4X strategy gets watered down by the take-that elements, and ultimately feels less than substantial. Still, if you are prepared for a massive take-that game, you’ll certainly enjoy yourself. Clockwork Wars is beautiful to look at, and even if we sort of wished for more substance each time we played, we always had an epic, enjoyable experience. iSlaytheDragon would like to thank Eagle-Grypon Games for providing a review copy of Clockwork Wars. About the “take that” “Hulk Smash” powers that make it impossible to implement a strategy in a fully deterministic way: I must say that I like the surprise that these powers involve. Such powers only encourage me to set off larger effects myself, by getting as many Espionage cards as my opponent. What matters ultimately is to fight for victory: in this game, even if the path to a high victory point count is not straight (because we are sometimes nudged by unpredictable events), one can damage our opponent’s path in the same way as he does ours. I feel that random effects tend to cancel each other, in Clockwork Wars, in part because they are not too swingy, and because there enough of them throughout a game.